The cover of this book immediately jumped out at me while searching NetGalley one day. When I read the description I was immediately intrigued but my stomach also turned. Would I be able to read this book without making myself sick? What should have been a quiet evening with friends turned into a night that forever changed Francis’ family. Francis lost his brother in what was ruled a tragic accident. The lone witness, Sam, the nine-year-old son of friends hasn’t said a word about that night. Leaving an air of mystery surrounding the evening. And now, twenty-three years later, Sam’s own nine-year-old son has disappeared. Cue the Law & Order dun dun! The one thing I didn’t like about this book was that I felt I didn’t get quite enough about the events of the night twenty-three years ago. However, I did like how the author incorporated the telling of that night’s events with what was currently happening. Was I surprised when I finally found out what transpired twenty-three years ago? YES! I did not see that coming. I was also surprised by the who-done-it regarding the disappearance of Sam’s son. Boy, 9, Missing is Nic Joseph’s debut novel and a non-stop thrill ride. Yes, the subject matter is disturbing but that’s what a good psychological thriller should do, right? Disturb you? I see a lot potential for this writer and look forward to her next book. 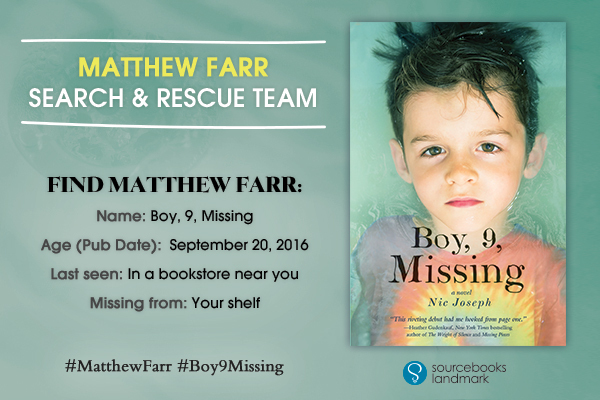 Want a chance to win an autographed copy of Boy, 9, Missing? Enter the giveaway sponsored by Sourcebooks HERE!